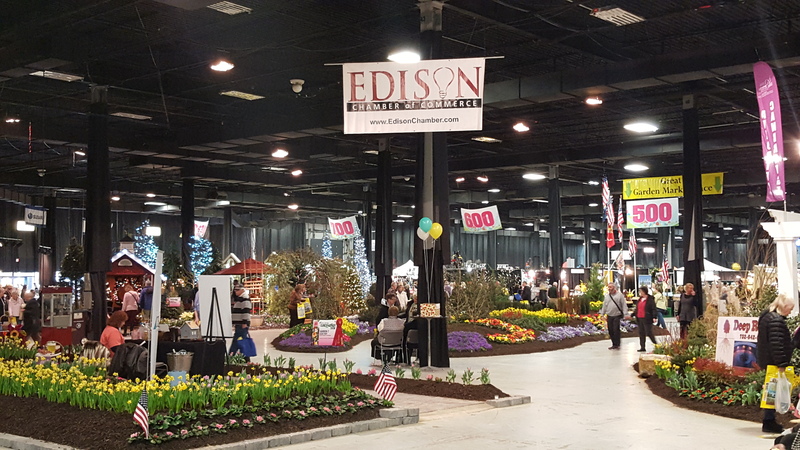 The first thing visitors to the New Jersey Flower and Garden Show last weekend saw was a giant floral E and a banner announcing the Edison Chamber of Commerce. Thanks go to our own Joe Coyle and Joe Cascio (of the NJ Expo and Convention Center) for pulling this together. We have some pictures on our website if you want to check them out. We were very happy to be able to promote two great local non-profits who are also Chamber Members, Edison Greenways and the Edison Tower. Both met hundreds of interested people who learned more about our community's history and its future. And now, thanks to all these folks' great work, we can call ourselves the Award Winning Edison Chamber of Commerce after being named the most educational display at the show! Well, second place. :-) The NJ Garden Club got first. In addition to our non-profit partners, Chamber members BCB Bank of Woodbridge, Barton Nursery and Raritan Bakery all had a great presence and showed how great our local business community is. If you missed this show, we still have tickets for the Boat Show this weekend. If you're interested in free tickets to these events -- Edison Chamber of Commerce Members only! -- call Trish at (732) 738-9482 and she'll arrange for you to pick them up. First come, first served so don't delay!